TransDevelopment has played a significant – and ongoing – role to help develop North America’s newest automotive assembly plant in Montgomery, Alabama. 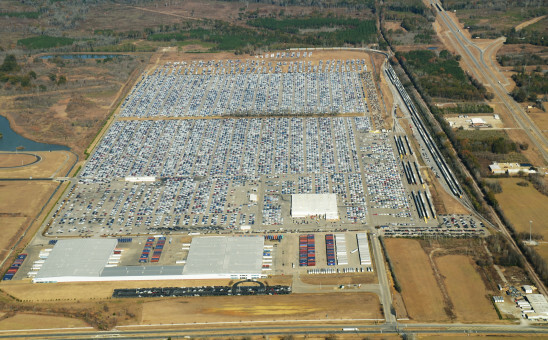 Beginning in 2000, TransDevelopment participated in a number of site evaluation studies throughout the Midwest and Southeast so Hyundai could make a final siting decision. Following the selection of the property in Montgomery, TransDevelopment provided conceptual planning as different arrangements of rail tracks, paved yards and buildings were studied by the international project team. Acting as CSXT’s design consultant, TransDevelopment coordinated the detail engineering of trackwork layouts and grades for more than eight miles of planned trackwork. In 2003, Hyundai, acting through GLOVIS, its logistics affiliate, commissioned TransDevelopment to prepare a detailed basis of design study for all aspects of the finished vehicle terminal, including processing shops, car wash and undercoat buildings, and vehicle shipping areas for a large, managed inventory vehicle yard. Hyundai Motor Manufacturing Alabama retained TransDevelopment in 2004 as the design-build contractor for all rail improvements at the site. Five support and five yard tracks were completed in early 2005, with a capability to spot and/or store more than 340 multi-level railcars.